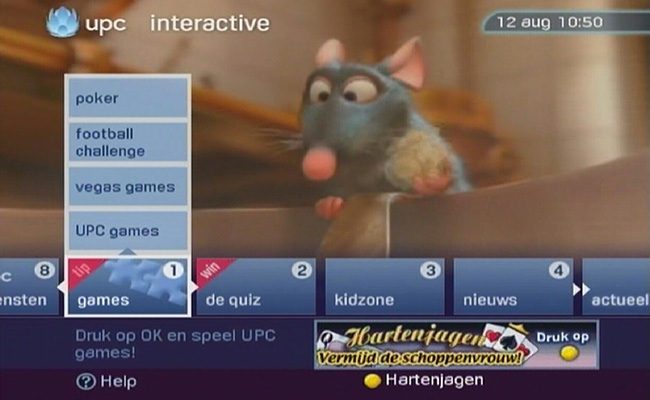 UPC Interactive was an interactive TV portal providing access to other interactive TV services on the UPC platform. The service was an interactive overlay on top of a broadcast barker channel. At UPC I was the product and marketing lead for the service. The service was unique as it was an in-list channel accessible via the EPG and the interactive button on the remote control that brought together all the interactive services on the platform. The product incorporated several additional marketing tools such as linking directly from the video to an interactive TV service and feature a new application at a top level within the menu.